Columbia Police Chief Skip Holbrook announces the arrest of a man accused of stealing money from a bank. 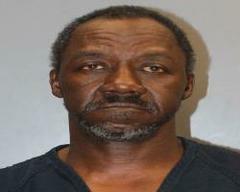 Sammie Bernard Greene (DOB: 10-12-1961) is charged with Entering a Bank with Intent to Steal. Greene allegedly passed a note to a teller demanding money from 2111 Devine Street shortly before 4:30 yesterday afternoon. The teller complied with the demands; No was inside the bank was injured during the robbery. Greene is then accused of leaving the bank in a taxi. Shortly after, CPD officers located Greene inside an apartment at Allen Benedict Court near Harden Street. During Greene’s arrest, Officers recovered the stolen money. Greene was taken to the Alvin S. Glenn Detention Center.